With temps reaching 100-plus degrees across much of the U.S., it’s a good time to brush up on heat-related illness. I flirted with death due to heatstroke once, and it will never happen again. Here are all the gory details. It was 90 degrees with nearly matching humidity: hot by any standards. Running to capture the last podium spot at a 50K, I remember stuffing ice cubes under my hat at the last aid station, rounding a corner to the finish, and then … and then I don’t remember anything. 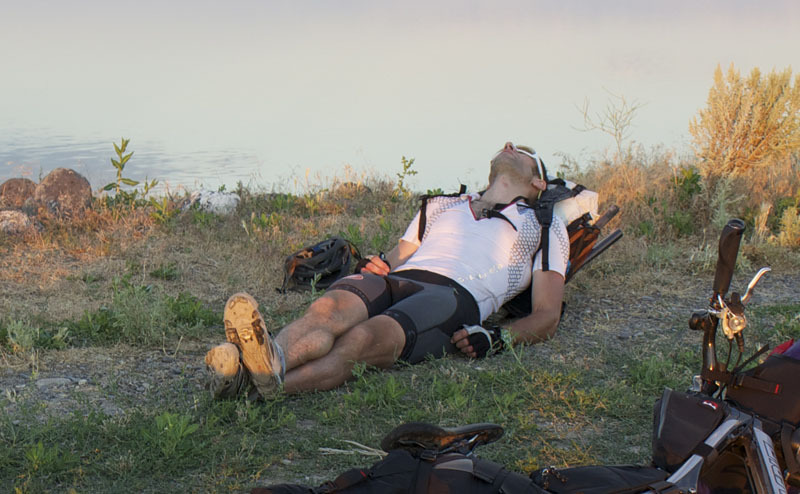 I don’t remember collapsing on the trail 5 miles from the tape, the other runners cutting their races short to help me, or arguing with them that I could still finish by crawling across the prairie floor. I don’t remember crapping my pants, having my clothes stripped from my body in front of a crowd of onlookers, being packed in ice like fresh-caught tuna, the ambulance ride, helicopter ride, or a doctor telling my wife this was bad — really bad. But I do remember waking up from a coma three days later, confused, with a trach tube shoved down my throat, trying to sputter words out. And how could I forget throwing up, going to the bathroom, and seeing black urine belching out of me into the toilet like duck blood soup? Apologies for the graphic description, but we’re in the dull heat of summer, and it’s wise to give it some respect. Because the consequences of not doing so can be gruesome … and worth sharing. 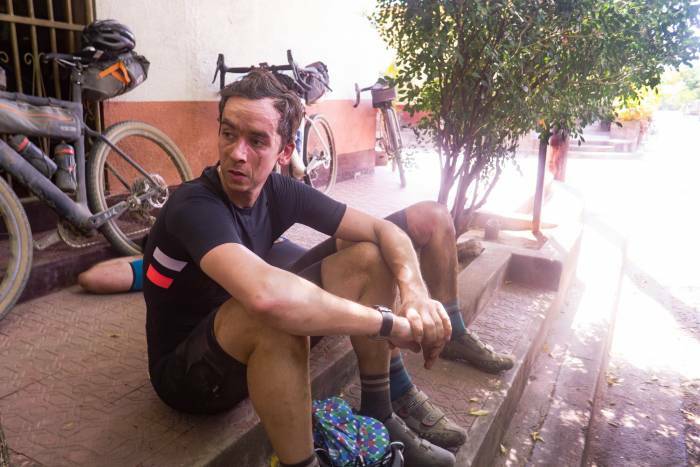 The science behind the events was pieced together by Dr. Christopher Minson, who focuses on heat and exercise physiology in the Department of Human Physiology at the University of Oregon, and from discussion with my team of physicians after the incident. Heat-Related Illness: What Is It? 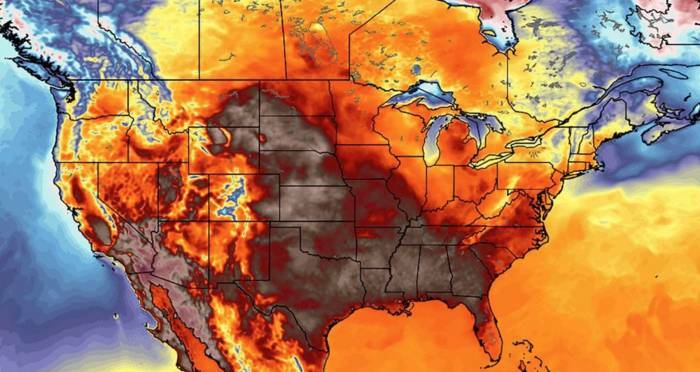 Is that a weather map, or is all of North America on fire? My body is a temple — an ancient, long-lost temple — strangled with ropey, fibrous vines from overuse, its foundation cracking. I’ve never broken a bone, but I’ve run it hard and put it up wet, incurring a series of physiological injuries along the way. The worst of which was heat induced. “Heat illness” is a broad term for a spectrum of injuries incurred from overexposure to heat. It could be mild (like dehydration or muscle cramps) or severe (like heatstroke). It doesn’t have to be searing hot to get sick from the heat. Even radiant heat from the rock underfoot can cause heat issues. But typically becomes a more critical issue when outside temperatures climb over 95 degrees Fahrenheit with humidity above 80 percent. But it also goes hand in hand with overexertion. Working out or doing chores in the heat requires energy. Like your car, part of that energy goes into motion, and the rest spills out as heat. As you work out, your internal temperature rises, but very little. The body’s high water content does a great job of stabilizing temperature, and, as humans, we have an exceptional ability to manage heat through a series of superficial vessel systems, sweating, and the physical powers of convection, radiation and evaporation. But problems arise when you’re not able to spill that heat off quickly enough and your internal temperature starts to climb. The threat is compounded when you go into the heat with underlying fatigue, overuse or illness … in other words, not feeling 100%. Beat the heat by tackling runs, hikes, or other activities in the morning when it’s cooler. Also, stay hydrated. Consume 27-33 ounces of water per hour. That’s about as much as the body can process. Use electrolytes or sports drinks with sodium chloride, potassium, and carbs. Sodium and potassium help replace electrolytes lost from sweat. Plus, sodium promotes thirst, which is a good thing if you need to take in more fluids. And carbs help stimulate fluid absorption in the small intestine. Promote sweat evaporation. Drenched, dripping wet with sweat won’t cool you down. Wear a light top that dissipates sweat and allows airflow to pull moisture away and with it heat. Finally, leverage your body’s innate adaptability. You can train the body to spill heat more efficiently by increasing exertion slowly. Get heat acclimated early in the season and train your body for the worse case scenarios. Treatment is specific to the illness. Here are some common heat illnesses and their respective treatments. No shade for cover. The author consumed with waves of heat cramps after riding 50 miles across the Idaho desert in 100-degree heat. Like a lightning strike through the body, heat cramps seize overworked muscles and can stop you dead in your tracks. It’s generally accepted that salts leach out of the body quicker in heavy sweaters. Dehydration compounds the issue. Heatstroke is serious, and victims need immediate medical attention. Keep a stack of thank-you cards nearby, because this one’s going to take a village to climb out of. Don’t give the victim anything to drink. There’s a chance they will vomit and inhale fluids (or vomit) into their lungs. Seek immediate medical attention. The victim needs an IV line and medicine to treat seizures, combative behavior, and shivering. Heat injuries can escalate from bad to worse quickly. One system failure trips another system to compensate, which inevitably fails — repeat. In my case, I ultimately incurred rhabdomyolysis. Shocked by the heat, my muscles began to break apart. Muscle proteins became lodged in my kidneys, clogging the body’s filtration mechanism. With a dialysis machine waiting outside the hospital room, docs quickly passed on the IV and instead rapidly poured liters of water — think 25 Nalgenes’ worth — into my subclavian vein to frack the kidneys free of myoglobin. When I got up to urinate, my body was 50 pounds heavier than when I went into the race three days before. I literally had to lift a large flap of bloated body to go to the bathroom. Heatstroke can be fatal. The only reason I came out was that a friend — a practicing nephrologist — had finished the 50K just as I was carried in. Struggling with his own heat issues, he shouted out a few key instructions that stopped the likely fatal progression of events: Ice, shade, 911. It’s hot out there. Bring electrolytes, stay hydrated, and stay safe.